This article is about Christ Church Cathedral (disambiguation). For other uses, see Christ Church Cathedral, Dublin (disambiguation). Christ Church Cathedral (or, more formally, The Cathedral of the Holy Trinity) is the cathedral of the United Dioceses of Dublin and Glendalough and the cathedral of the Ecclesiastical province of the United Provinces of Dublin and Cashel in the Church of Ireland. It is situated in Dublin, Ireland, and is the elder of the capital city's two medieval cathedrals, the other being St Patrick's Cathedral. Christ Church is officially claimed as the seat (cathedra) of both the Church of Ireland and Roman Catholic archbishops of Dublin. In law, and in fact it has been the cathedral of only the Church of Ireland's Archbishop of Dublin, since the English Reformation. Though nominally claimed as his cathedral, the Roman Catholic Archbishop of Dublin uses St Mary's in Marlborough Street in Dublin as his pro-cathedral (acting cathedral). Christ Church Cathedral is located in the former heart of medieval Dublin, next to Wood Quay at the end of Lord Edward Street. However a major dual carriage-way building scheme around it separated it from the original medieval street pattern which once surrounded it, with its original architectural context (at the centre of a maze of small buildings and streets) lost due to road-building and the demolition of the older residential quarter at Wood Quay. As a result, the cathedral now appears dominant in isolation behind new civil offices along the quays, out of its original medieval context. In recent years the Cathedral has offered a great set for Medieval Dramas such as the CW's hit drama "Reign". The Main Building of "Christchurch Cathedral" was used to film pivotal moments in the drama's pilot. The Cathedral also offered a great backdrop to the hit drama "the Tudors" which was Christchurch's Cathedrals longest running Television show to be filmed within the compounds of the Cathedral, Many Dresses and outfits worn by Maria Doyle Kennedy (Catherine of Aragon) and Jonathon Rhys Myers (King Henry) are available to be viewed within the crypt of Christchurch Cathedral. Christ Church is the only one of the three cathedrals or acting cathedrals which can be seen clearly from the River Liffey. The cathedral was founded probably sometime after 1028 when King Sitric Silkenbeard, the Hiberno-Norse king of Dublin made a pilgrimage to Rome. The first bishop of this new Dublin diocese was Dúnán or Donat, and the diocese was at that time a small island of land surrounded by the much larger Diocese of Glendalough, and was for a time answerable to Canterbury rather than to the Irish Church hierarchy. The church was built on the high ground overlooking the Viking settlement at Wood Quay and Sitric gave the "lands of Baldoyle, Raheny and Portrane for its maintenance." Of the four old Celtic Christian churches reputed to have existed around Dublin, only one, dedicated to St. Martin of Tours, lay within the walls of the Viking city, and so Christ Church was one of just two churches for the whole city. The cathedral was originally staffed by secular clergy. The second Bishop of Dublin introduced the Benedictines. 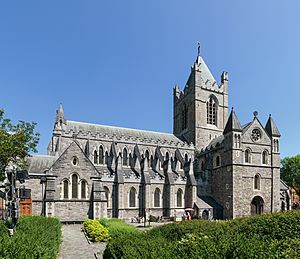 In 1163, Christ Church was converted to a priory of the Regular Order of Arrosian Canons (Reformed Augustinian Rule) by the second Archbishop of Dublin, later saint, Laurence O'Toole, who adhered to the rule himself; it was subsequently headed by an Augustinian prior, who ranked as the second ecclesiastical figure of the diocese, and not a dean, until re-establishment in 1541. 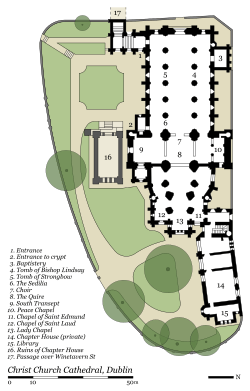 This priory, the Priory of the Holy Trinity, became the wealthiest religious house in Ireland, holding over 10,000 acres (40 km2) of property in County Dublin alone, most notable of which were the three home farms held at Grangegorman, Glasnevin and Clonken or Clonkene, now known as Deansgrange. Henry II attended the Christmas service at the cathedral in 1171. According to the cathedral guidebook this was the first time Henry received Holy Communion following the murder of Thomas Beckett by Henry's knights in Canterbury. In the 1180s, Strongbow and other Norman magnates helped to fund a complete rebuilding of Christ Church, initially a wooden building, in stone, comprising the construction of a choir, choir aisles and transepts, the crypt and chapels to St. Edmund and St. Mary and St. Lô. A chapel to St Laurence O'Toole was added in the 13th century and much of the extant nave was built in the 1230s. Its design was inspired by the architecture of the English western school of Gothic, and its wrought stones- of a Somersetshire oolite- were sculpted and laid by craftsmen from the same area. In 1300 Richard de Ferings, Archbishop of Dublin arranged an agreement between the two cathedrals, the Pacis Compostio, which acknowledged both as cathedrals and made some provision to accommodate their shared status (see below for more on this). In the 1350s a major extension was undertaken by John de St Paul, Archbishop of Dublin 1349-62. By 1358, the nave of the cathedral was partly in use for secular purposes and a "long quire" was added, extending the old choir area by around 10 metres. St Paul also installed an organ. His works were destroyed by the major rebuilding project in the 1870s. In 1480 the wealthy judge William Sutton bequeathed all his lands and silver to the Cathedral. The cathedral was the location of the purported coronation, in 1487, of Lambert Simnel, a boy pretender who sought unsuccessfully to depose Henry VII of England, as "King Edward VI". In 1493, the choir school was founded. In 1539, King Henry VIII converted the priory to a cathedral with a dean and chapter and worked to ensure Christ Church adhered to his new church structure. His immediate successor, Edward VI of England, in 1547, provided funds for an increase in cathedral staffing and annual royal funding for the choir school. King Edward VI formally suppressed St Patrick's Cathedral and, on 25 April 1547, its silver, jewels and ornaments were transferred to the dean and chapter of Christ Church. This episode ended with a late document of Queen Mary's reign, a deed dated 27 April 1558, comprising a release or receipt by Thomas Leverous, dean, and the chapter of St Patrick's, of the "goods, chattels, musical instruments, etc." belonging to that cathedral and which had been in the possession of the dean and chapter of Christ Church. Queen Mary I of England, and later James I of England, also increased Christ Church's endowment. Meanwhile, in 1551, divine service was sung for the first time in Ireland in English instead of Latin. In 1560, the Bible was first read in English. The foundations of the nave, resting in peat, slipped in 1562, bringing down the south wall and the arched stone roof (the north wall, which visibly leans, survived, and largely dates back to 1230). Partial repairs were carried out but much of the debris was simply levelled and new flooring built over it until 1871. In 1620 the English-born judge Luke Gernon observed that Christchurch was in a better state of repair than St. Patrick's. In the 17th century, both parliament and the law courts met in buildings erected alongside Christ Church. King James II himself presided over a state opening of parliament in that location. However, parliament and the law courts both moved elsewhere: the law courts to the newly built Four Courts on the river front, and Parliament to Chichester House in Hoggen Green, into the building which is now The Bank of Ireland, College Green. Like nearby St Patrick's, the building was in poor condition for much of the 19th century. After the building was declared unsafe and no longer fit for use, some limited works were carried out by Matthew Price (architect) between 1829 and 1831. The cathedral was extensively renovated and rebuilt from 1871 to 1878 by George Edmund Street, with the sponsorship of distiller Henry Roe of Mount Anville. The great 14th century choir was demolished and a new eastern end was built over the original crypt. He built a new chapter house. The tower was rebuilt. The south nave arcade was rebuilt. The flying buttresses were added as a decorative feature. The north porch was removed. The baptistry was built in its place. Street built the adjacent Synod Hall, taking in the last remnant of St Michael and All Angels's Church, including the bell tower. The synod house is linked to the cathedral by Street's iconic covered footbridge. Roe spent over £230,000 at the time (over €26 million in 2006 terms). Further renovations were carried out, notably between 1980 and 1982. Christ Church is the centre of worship for the united dioceses and holds notable annual events such as the Citizenship Service. As the cathedral of the southern province of the Church of Ireland it also hosts ordinations of priests and consecrations of bishops. Interior of Christ Church Cathedral. Following the extensive renovation in Victorian times, while the seriously decayed structure was preserved from collapse, it remains difficult to tell which parts of the interior are genuinely medieval and which parts are Victorian pastiche. 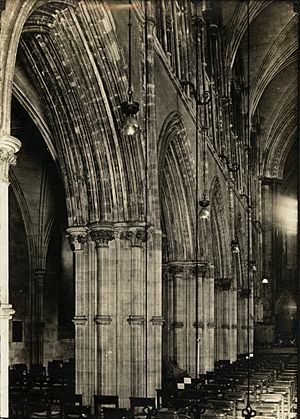 Photographs taken from the exterior show the dramatic nature of the rebuilding done by the Victorians: Archbishop de St Paul's 14th-century cathedral, in particular the "long choir", was almost entirely destroyed. Nonetheless, Christ Church remains a fascinating sampling of surviving medieval and later church building. The cathedral famously contains the reputed tomb of Strongbow, a medieval Norman-Welsh peer and warlord who came to Ireland at the request of King Diarmuid MacMorrough and whose arrival marked the beginning of Anglo-Norman involvement in Ireland. According to the Christ Church Cathedral website, in 1562 the nave roof vaulting collapsed and Strongbow's tomb was smashed; the current tomb is a contemporary replacement from Drogheda. As is well documented from a number of sources, the tomb of Strongbow was used as the venue for legal agreements from the 16th to the 18th centuries. Alongside the main tomb is a smaller figure with sloping shoulders, suggesting a female figure, but wearing chain mail, which may indicate that it was a child. Christ Church also contains the largest cathedral crypt (63.4m long) in Britain or Ireland, constructed in 1172-1173. Having been renovated in the early 2000s, it is now open for visitors. a tabernacle and set of candlesticks which were used when the cathedral last operated (for a very short time) under the "Roman rite", when the Roman Catholic king, James II, having fled England in 1690, came to Ireland to fight for his throne and attended High Mass in the temporary restoration of Christ Church as a Roman Catholic cathedral. "The Cat & The Rat" are displayed with an explanatory note. Behind the altar area, there is the Chapter House, which contains cathedral offices, meeting rooms and other facilities. At the west end of the cathedral is a fully integrated stone bridge, leading to the former synod hall, which was built on the site of St Michael's, a prebendal church of Christ Church's which was demolished by Street during his restoration of the cathedral. This hall, which incorporates the old St Michael's tower, was formerly used for hosting general synods and diocesan synods for Dublin, Glendalough and Kildare. It is now home to the Dublinia exhibition about medieval Dublin. The 1868 Church Commissioners' report proposed making St Patrick's the sole cathedral and reducing Christ Church to a parish church. 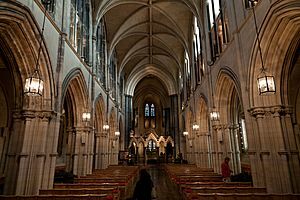 To this day, the acting seat of the Roman Catholic Archbishop of Dublin, St Mary's, is known as a "pro-cathedral" in acknowledgement of the fact that the Holy See claims Christ Church as the rightful seat of the Roman Catholic archbishop. There is a dean's vicar (and clerk of the chapter), a vicar of the Cathedral Group of Parishes and posts for a curate assistant and a student reader. There are also usually honorary clerical vicars. Christ Church has a long musical history, with a well-known cathedral choir and a girls' choir. Along with the precentor, the musical side of its work is led by the "Organist and Director of Music", working with any assistant organist and organ scholar, as well as the "Honorary Keeper of the Music and Music Librarian" and, as at 2007, a "Music Development Officer". Christ Church Cathedral probably had at least one ringing bell from its foundation. By 1440 there were known to be three great bells in the tower; however on 11 March 1597, an accidental gunpowder explosion on one of the nearby quays damaged the tower and caused the bells to crack. The effects of this blast also damaged the tower nearby of St. Audoen's Church. The most recent augmentation was in 1999 when an additional seven bells were added to the ring, giving a grand total of 19 bells, a world record for bells rung this way. Although this does not produce a diatonic scale of 19 notes, it does uniquely provide a choice of combinations: three different 12-bell peals (in the keys of B, C# and F#) as well as 14 and 16 bell peals. At the time of the augmentation, this was only the second 16 full circle bell peal in the world – St Martin's Church in Birmingham being the first. The bell-ringing work is led by the "Ringing Master and Master of the Tower". Christ Church has a range of historical archives and has arranged for a number of publications over the years, as well as maintaining a website since the 1990s. This work is overseen by the "Honorary Keeper of the Archives" and the "Web and e-mail Editor, along with the "Honorary Secretary of Christ Church Publications, Ltd". The cathedral is supported by the voluntary Friends of Christ Church Cathedral, founded in 1929, and working with the cathedral authorities in a variety of ways. As Christ Church receives no regular state support, while it welcomes all guests and has a chapel for those who simply wish to pray, there are fees for sightseeing, which can also be paid in combination with the purchase of a ticket for the neighbouring Dublinia exhibition. There is a gift shop with souvenirs, recordings of cathedral music groups and publications. In 1971, the General Synod, following prior discussions, created the "Christ Church Cathedral Group of Parishes", uniting what were then four parishes with the cathedral, whose dean is their rector: St Andrew's, St Werburgh's, All Saints (Grangegorman) and St Michan's, St Paul and St Mary. The parishes are overseen day-to-day by a vicar appointed by a special board of patronage. The heart of Lorcán Ua Tuathail (Saint Laurence O'Toole / Archbishop of Dublin). It was stolen from the cathedral on 3 March 2012. Christ Church Cathedral, Dublin Facts for Kids. Kiddle Encyclopedia.